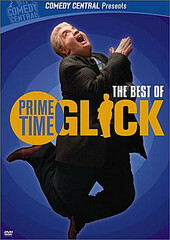 Primetime Glick, starring Martin Short as a 300-pound talk show host, Jimmy Glick, gives new direction to the tired, standard talk show format. Not bothering to do any research on his guests, and at times so dumb and out-of-the-loop on his guests' latest bodies of work (Glick admits to preferring to focus on their more obscure material), you can't help smile at the satirical take on talk shows. Ironic, blunt, and self-centered on Glick more than his guests, The Best of Primetime Glick finds Glick posing the tough questions to guests such as Janeane Garafalo, Kathie Lee Gifford, Eugene Levy, Bill Maher, Steve Martin, Dennis Miller, Conan O'Brien, John Salley, and Jerry Seinfeld. Bonus material includes extra interview footage with Janeane Garafalo, Kathie Lee Gifford, Steve Martin, and Conan O'Brien. Hilarious and brilliant, The Best of Primetime Glick finds Jimmy Glick at his finest, serving up the laughs without pulling the punches. I'll give it a B.